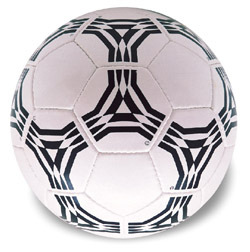 Art #15 LAHORI DULL: 32 Panel Soccer Ball from locally made material. Latex Bladder, laminated with 2-cotton layers and 2-polyester layers backing. Has all the specification for a game ball. However, normally used as promotion purpose. Available in size 5. 32 Panel Soccer Ball from locally made material. Latex Bladder, laminated with 2-cotton layers and 2-polyester layers backing. Has all the specification for a game ball. However, normally used as promotion purpose. Available in size 5.